The ex parte Appellant successfully argued that the Examiner had not established a prima facie case of obviousness by failing to adequately explain why one skilled in the art would have made the proposed modification in Ex parte Tisol (Appeal No. 2017-007929, decided April 25, 2018). an actuating assembly including a stripper plate, a connecting member having a distal beam within a retaining sleeve that is moveably secured to the stripper plate, and at least one ejection member, wherein the connecting member is configured to securely retain the first fastener portion, wherein the stripper plate is configured to be moved relative to the connecting member in order to drive one of the first or second fastener portions into the other of the first or second fastener portions to form a fully-formed fastener, wherein the stripper plate is positioned around at least a portion of the connecting member as the stripper plate is moved relative to the connecting member, and wherein the at least one ejection member is configured to eject the fully formed fastener from the actuating assembly. The Examiner rejected this claim as obvious based on a single-reference modification. 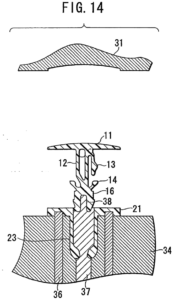 A figure from the prior art reference is reproduced below, which, in combination with the specification, discloses a fixed die 31, a core pin 37, and a movable die 34. 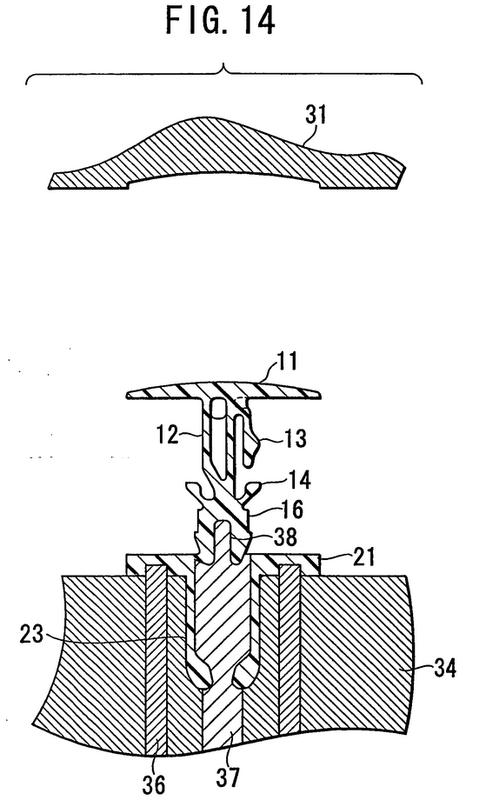 The Board agreed with the Appellant that, while the prior art reference does disclose the potential reversal of function for the fixed die 31 and the movable die 34, “we find no disclosure in [the prior art reference], and the Examiner directs us to none, that would lead one skilled in the art to effect the modification…as proposed by the Examiner.” This required a little deeper analysis by the Board. In particular, the Board seemed to latch onto the notion that the Examiner failed to explain how all of the components would interact if such a reversal is made, most importantly, how the stripper plate would be moveable relative to the connecting member, which is claimed. This case illustrates the well-known notion, as quoted in KSR, that an obviousness rejection requires more than mere conclusory statements, and instead, requires an articulated reasoning with some rational underpinning. In this case, this argument was presented as a second argument, the first argument being that the proposed modification would have changed the principle operation of the prior art reference, which some may argue is a stronger type of argument if factually sound. The Board did not address that primary argument, which is a reminder that consideration should be given to layering arguments in the Appeal Brief.